Although the swirling blue slides aren’t visible the exact moment you step off the ship at Amber Cove cruise port, they could be. 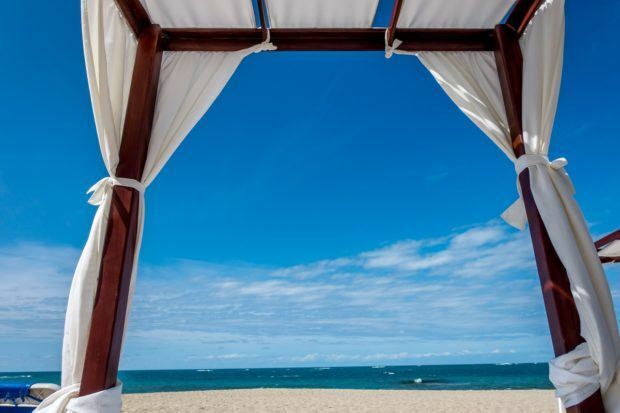 Instead, what you see are the brightly-colored cabanas tantalizingly balanced on the wooden walkway over the ocean. If you’re not sure what to expect from your day (or longer) in the port of Puerto Plata, Dominican Republic, Amber Cove will warm you up. 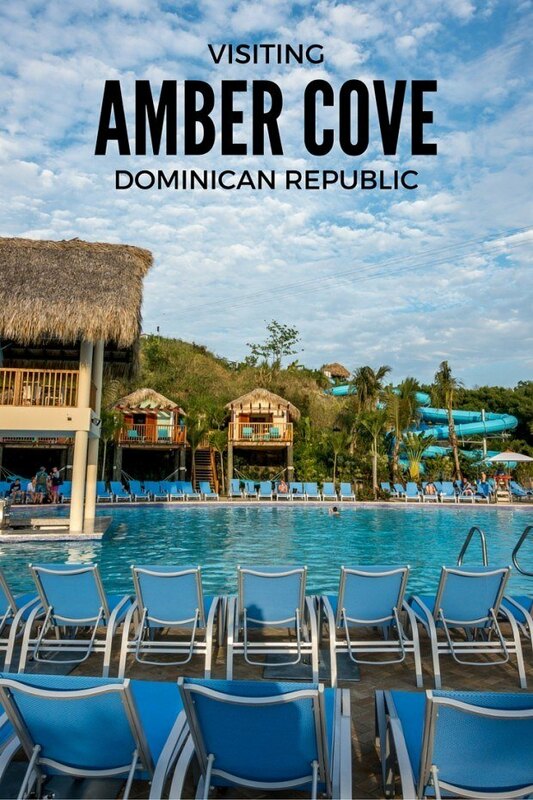 Amber Cove cruise port is the exclusive port for Carnival Corporation’s lines, including Holland America, Princess, and Carnival. (I first visited on the now-defunct Fathom line.) Opened in late 2015, the $85 million port is located near Puerto Plata on the northern coast of the Dominican Republic. 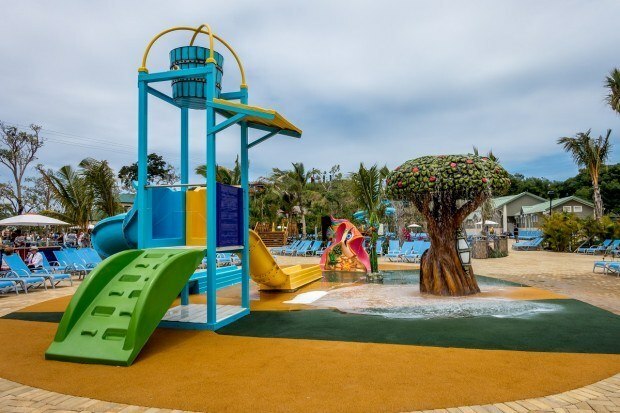 Although the port itself doesn’t have a beach, there are lot of options for on-site activities, and it is close to great beaches and other attractions. 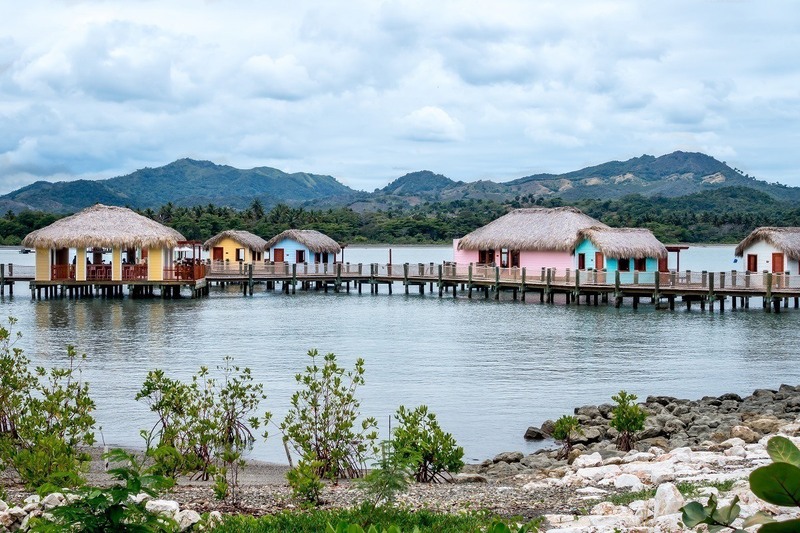 The Dominican Republic port has many things that are typical of a cruise port in the Caribbean, but there are also lots of activities and offerings that set it apart, making Amber Cove a destination itself. It’s not usually my style to hang out at the port when I take cruises. Usually I’m off exploring local beaches, scuba diving, or snorkeling. But sometimes you need a balance between adventure and relaxation, and Amber Cove is great for that. Here’s a look at some of the things you can do in the comfort of the cove. The port area is large, so there’s a lot to see. 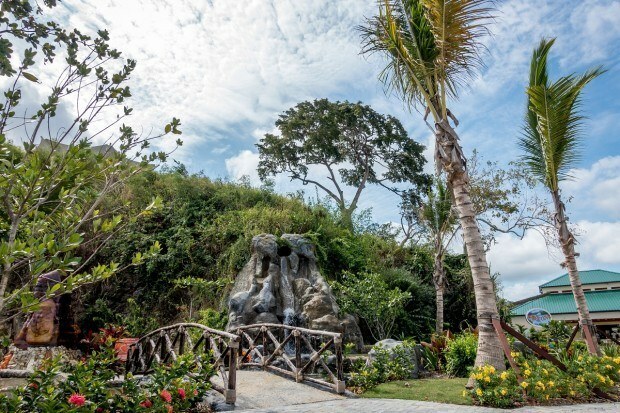 There are palm trees, man-made waterfalls, waterside hammocks, and fountains. In the main plaza, you’ll find giant colorful masks with descriptions explaining their significance. The huge Amber Cove sign—conveniently positioned with your ship in the background—is a great place for taking photos. Afterward, get your passport stamped at a kiosk in the center of the port. The shops at Amber Cove are open when the ships are in port. There is, of course, a Diamonds International (this is obligatory at every port, right?) and a full complement of souvenir shops. There is every kind of duty-free rum you could hope for, with free tastings available. 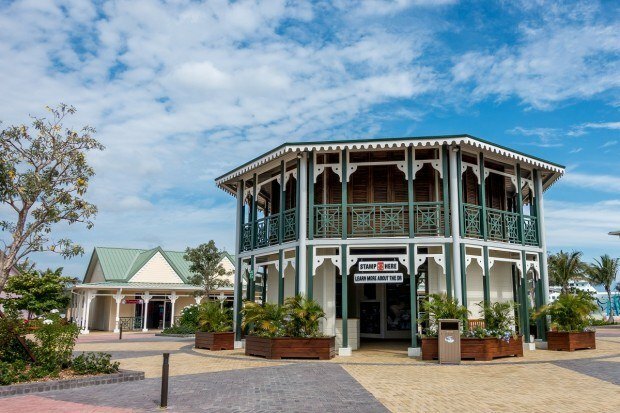 The most unique shopping opportunity at the port is the artisan market. You’ll find a variety of local products, including food items like chocolate, handmade recycled paper, jewelry, and more. Because the products are truly local, purchases here help to support the local economy beyond the port. The winding pool (numerous lifeguards included) occupies a large section of the Amber Cove cruise port. 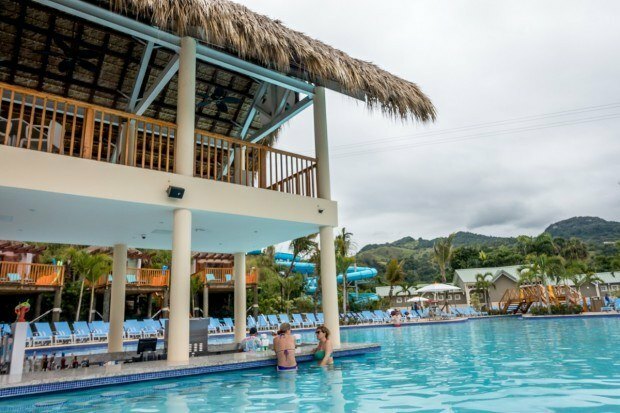 It twists and turns at different depths that are perfect whether you want the wading area for children or the deeper area that becomes a swim up bar at the Coco Cana. And what’s not to love about a swim up bar? Plus, there’s a sea of pristine, blue lounge chairs just waiting for guests. 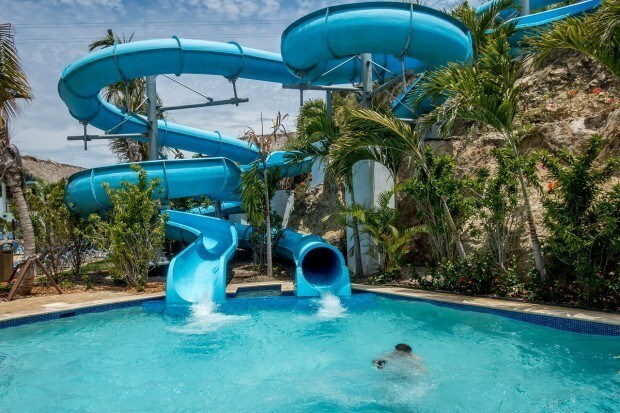 Just next to the pool area are those alluring, swirling slides. The side-by-side tubes allow you to race your friends to the bottom and provide just as much (if not more) fun for adults as for kids. 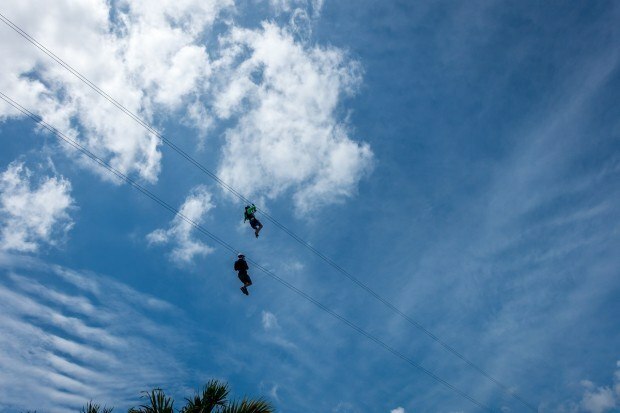 If you’re looking for something even more active, clip onto the twin zip lines that run above the pool. For just $20, you can speed down them an unlimited number of times. Nearby, you can rent pretty much any kind of equipment you need to make your day more enjoyable. Kayaks ($19-46) and stand up paddleboards ($20-32) can help you explore the bay adjacent to the port. For something different, try out an aquaboat cycle—like a cross between and paddle boat and a bicycle. 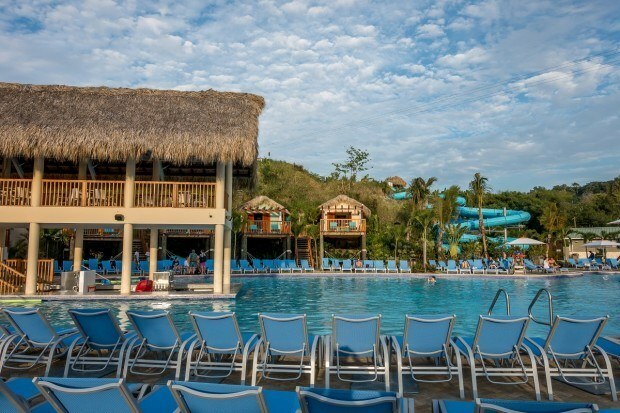 Yes, there’s Coco Cana in the pool area, but there are other options if you want to get away from some of the crowds. The aptly-name Sky Bar at the top of the hill is a great place to watch the sunset, or you can head to El Cibao Café for coffee. At El Cibao, you can learn about coffee production in the Dominican Republic and sample the different varieties. As much fun as the cruise port is, there is lots of natural beauty to see in the surrounding area. Consider booking a tour or venturing out on your own. These tours are solid options for how to spend a day in port. My favorite activity during my visit to the Puerto Plata area was a trip to Playa Dorada. This half-day trip will ensure you get in some quality beach time. If you want time in the water plus a bit more adventure, check out this visit to a local waterfall. To take your activity level up yet another notch, consider this 4×4 ATV adventure. Puerto Plata is an area rich in culture. This three-hour tour will take you to the malecon, have you visit a local rum factory, and see gorgeous mountaintop views. Those that are looking for adventure beyond the Amber Cove port just need to walk in, turn left, and head out near the back of the port complex. 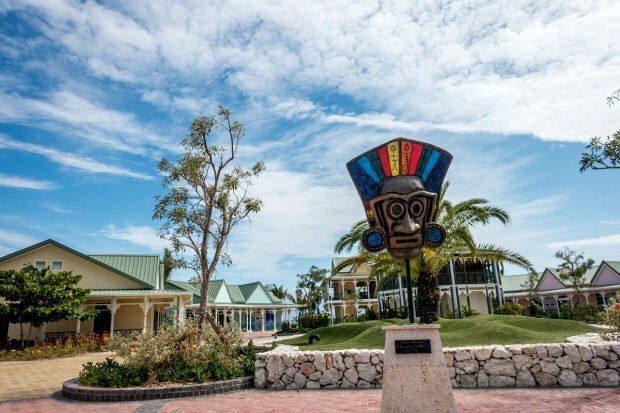 That’s where you’ll find the National /Alamo car rental counter if you’re feeling like exploring the island on your own. If you’re looking for something between a planned shore excursion and a sporty day driving yourself in the Dominican Republic, the taxi stand can help you have a day in town, take a trip to the 27 waterfalls attraction, or do any of the other things to do on the island. Be aware that the taxis are pricey compared to those at other Caribbean ports, so you may want to gather a group. Do you have a favorite spot in the Caribbean? 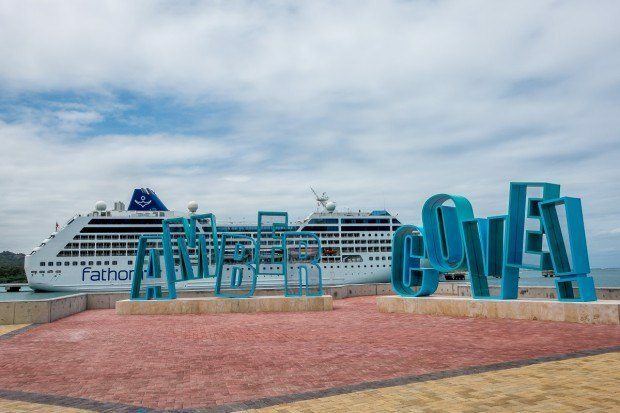 What do you think about Inside the Dominican Republic’s Amber Cove Cruise Port? Looks like a really fun place to visit 🙂 Nice photos! If you’re arriving on a Princess ship, is there any charge for using the pool area? Also, with the swim up bar and such, how does one pay for drinks? I.e. is it local currency, or can you charge to your cabin. Only ships from Carnival Corporation use Amber Cove. Princess would be included in that, so I doubt you’d have any extra charges to use the pools. I don’t believe you can charge to your cabin, though, because the businesses are individually owned. I just used a credit card. Amber Cove is beautiful. I loved it there when we visited in April 2016. My husband & I chose the excursion to swim with the Dolphins. So we went to Ocean World. The park was beautiful. It was so clean and well kept. It was not crowded at all. We got to see the excellent bird show. We were getting ready to see the sea lion show when it was our turn to swim with dolphins. I will admit at first I was very scared to get in the water and our group instructor/trainer (not sure his title) was so nice and understanding. Finally I just jumped in. It was the greatest experience of my life. My husband even loved it and had a great time. It was honestly amazing. An experience I know I will never forget. It was well worth the money it cost. There is 2 different dolphin excursions…1 is an interaction with the dolphins you do get in the water with them but you do not actually swim with them. the 2nd you do a lot more interacting with the dolphins and you actually get to swim with them I believe this one is $40 more… it is well worth it. I absolutely do not regret choosing this excursion however I would of loved to have seen more of the Dominican Republic…it looked beautiful. I am planning on taking another cruise with Amber Cove being a stop just because I want to explore this place. I am extremely excited about this I can not wait to see everything the island has to offer. Thanks for your comment, Virginia. We’re glad you enjoyed the experience in Puerto Plata. It’s a great place with many different things to do. We would strongly encourage visitors to steer clear of activities that involve interacting with animals in captivity. I think sodas and water may be included, but I would assume most food and drinks are an additional expense. I didn’t get a cabana, though, so I cannot say for sure. I haven’t been at that time of year, so I can’t say for sure, but I would imagine they would be up by then. Is there a charge to use the 300,000 sq ft pool area at Amber Cove? If you’re a cruise passenger, it should be free.